Objective There are limited data on health-related quality of life (HRQOL) for infants and toddlers with congenital heart disease (CHD). 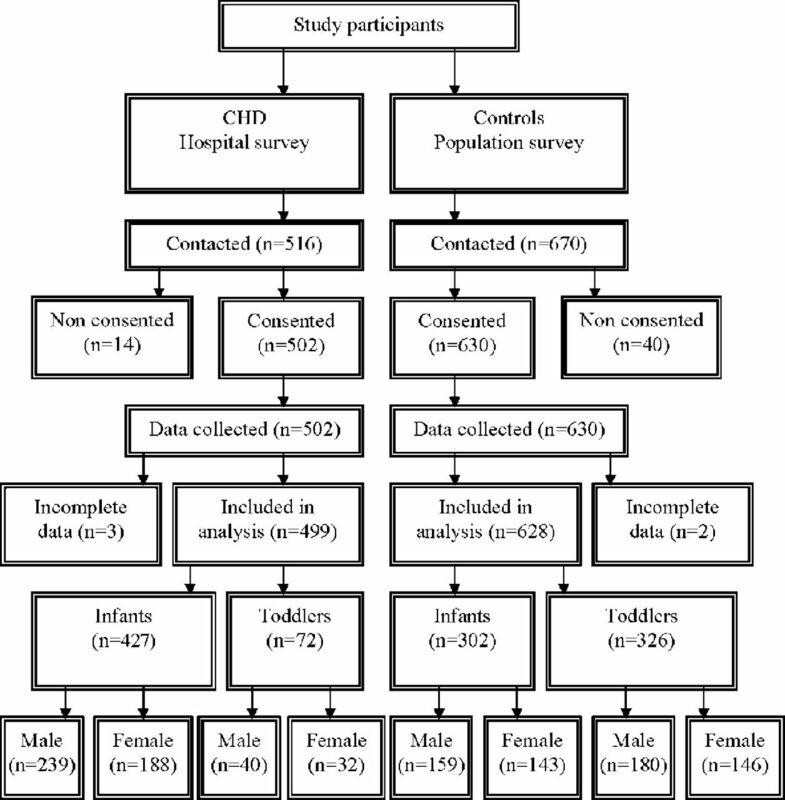 We sought to compare generic HRQOL of infants and toddlers between CHD subjects and controls. Design Dual-setting, cross-sectional analytical survey. Setting We collected HRQOL data on infants and toddlers through a community survey for controls and through a hospital-based survey for those with CHD. Patients A total of 499 subjects with confirmed CHD in the age group of 1–24 months admitted for elective surgery in the study institution were selected by consecutive sampling. In addition, we selected 628 control children in the same age group from an area within the 10 km radius of the study institution. Main outcome measures The data contain parent proxy report of HRQOL. The Pediatric Quality of Life Inventory (PedsQL 4.0) was used to collect HRQOL data. Questionnaires were self-administered for parents. Results The mean total proxy HRQOL scores were significantly higher in control infants compared with infants with CHD (adjusted mean difference 5.0, 99% CI 2.5 to 7.5, p<0.001). Corresponding figure for toddlers was 7.6 (95% CI 5.0 to 10.2, p<0.001). There was no significant difference in total HRQOL scores across CHD functional classes among infants and toddlers (p=0.212 and p=0.502, respectively). Conclusions Infants and toddlers with uncorrected CHD have significant deficiency in proxy HRQOL compared with their controls. The functional class of CHD appears to have no differential impact on overall HRQOL deficiency in this age group. Health-related quality of life (HRQOL) is essential for assessing the overall physical, psychological and social well-being of infants, children and adolescents. HRQOL deficiency related to chronic diseases like congenital heart disease (CHD) is a hidden morbidity in childhood and adolescence that merits urgent attention. HRQOL of Indian infants and toddlers with CHD differs significantly from their control counterparts. There is an overall deficiency of HRQOL as well as specific deficiency in majority of the HRQOL domains among infants/toddlers with CHD. This HRQOL deficiency related to CHD merits urgent attention and appropriate interventions especially in low-resource settings. The primary objective of this study was to compare proxy generic HRQOL values of infants and toddlers aged 1–24 months with uncorrected CHD admitted for corrective surgery with their counterparts without CHD from a representative community setting utilising the Pediatric Quality of Life Inventory (PedsQL 4.0).6 The secondary objectives were to (1) examine the feasibility, reliability and discriminant validity of the PedsQL Generic Core Scale for CHD in the Indian context, and (2) examine the association between functional class categories (FCC) of CHD and HRQOL in infants/toddlers with CHD. The study was coordinated by Amrita Institute of Medical Sciences and Research Centre, Kochi, Kerala, India. The study period was 42 months (January 2013–June 2016). The study design is a dual-setting, analytical, cross-sectional survey. We used the mean proxy HRQOL for healthy as well as chronically ill infants and toddlers published by Varni et al 6 to calculate the sample size. Varni et al 6 reported an effect size of 1.36 for infants and 1.75 for toddlers related to proxy HRQOL comparison between healthy and chronically ill subsets. We selected an alpha of 0.01 and 0.99 of desired power, providing us with a minimum sample size of 33 infants and 18 toddlers in each group (subjects with and without CHD). All infants (n=427) and toddlers (n=72) with CHD enrolled in a previous study were included in the current study. We recruited 630 controls from the community for comparing their mean total HRQOL with that of the available infants and toddlers with CHD (n=499). The sample size thus permitted us to pick a minimum mean difference in proxy total HRQOL of 4.8 for infants and 9.0 for toddlers in the CHD versus controls comparison. We increased the sample size to the current level anticipating significant subgroup differences in HRQOL based on FCC of CHD. Infants/toddlers with uncorrected CHD were recruited by consecutive sampling. The inclusion criteria for CHD subjects included (1) infants/toddlers aged 1–24 months with CHD, (2) those admitted for a planned surgical correction of CHD in the study institution and (3) infants/toddlers from families who can comprehend local languages (Malayalam/Tamil). The exclusion criteria included infants/toddlers who were presented to the study institution in an acute stage requiring intensive care treatment and/or emergency surgical correction of CHD. The PedsQL 4.0 generic scale for 1–12 months consists of 36 items in five domains designed to assess parents’ perception of their infant’s HRQOL: (1) physical functioning (six items), (2) physical symptoms (10 items), (3) emotional functioning (12 items), (4) social functioning (four items) and (5) cognitive functioning (four items).6 The scale for 13–24 months consists of 45 items: (1) physical functioning (nine items), (2) physical symptoms (10 items), (3) emotional functioning (12 items), (4) social functioning (five items) and (5) cognitive functioning (nine items).6 The original tool was available in English and was translated to the local languages (Malayalam and Tamil) by the study team. The local language versions were back-translated to English by another team not exposed to the original English version. The original and back-translated versions were checked for content validity and concurrence by a team of experts (child psychologist, paediatrician and medical social worker). A 5-point Likert response scale (0–4) was used for scoring responses. All items were reverse-scored and linearly transformed to a 0–100 scale (0=100, 1=75, 2=50, 3=25, 4=0). Component Scale Scores were computed as the sum of the items divided by the number of items answered. A higher score signify better HRQOL.6 The use of PedsQL was licensed for this study through a one-time payment to the licence holders (Mapi Research Trust, Lyon, France). The details of the study population are presented in table 1. We enrolled 302 infants (1–12 months) and 326 toddlers (13–24 months) as controls. We also enrolled 427 infants and 72 toddlers with uncorrected CHD who were admitted for elective surgery in the study institution. Among those with CHD, only 11 (2.6%) infants and 13 (18.06%) toddlers had a history of surgical intervention for CHD. The overall response to the household survey was 94.03% and for the hospital survey was 97.3%. A flow diagram reporting the recruitment details and response rates is presented in figure 1. Study flow chart. CHD, congenital heart disease. The scale descriptives from the study sample are presented as Cronbach’s alpha in table 2. There is good internal consistency reliability (Cronbach’s alpha >0.7) for total scores, summary scores and individual components of HRQOL in both CHD subjects (0.728–0.949) as well as their control counterparts (0.743–0.882). Comparison of mean HRQOL between CHD and control groups was done for total and component HRQOL scores. The details are presented in table 2. The reported mean differences in HRQOL scores were adjusted for gender, socioeconomic status and domicile. The adjusted mean difference in total HRQOL between control infants and infants with CHD was 5.0 (99% CI 2.5 to 7.5 p<0.001) and between control toddlers and toddlers with CHD was 7.6 (99% CI 5.0 to 10.2, p<0.001). All HRQOL component means except social functioning (p=0.470) and cognitive functioning (p=0.618) were significantly higher for control infants compared with infants with CHD. A similar pattern of significantly higher HRQOL domain means was seen for control toddlers compared with toddlers with CHD except for social functioning (p=0.012) and cognitive functioning (p=0.201). We estimated the prevalence of significantly impaired HRQOL among subjects with CHD using locally derived normal population data (normal population mean – 1 SD as the cut-off) as suggested by Varni et al and used earlier in older children with CHD by Uzark et al.5 10 Accordingly, 174 infants (40.7%) and 22 toddlers (30.6%) in the CHD group had impaired total HRQOL when calculated based on the mean value of total HRQOL of the control subjects in the current study. The prevalence of significant impairment across HRQOL domains for infants with CHD was 33.9% for physical functioning, 33.6% for physical symptoms, 34.4% for emotional functioning, 16.5% for social functioning and 20% for cognitive functioning. The corresponding figures for toddlers were 38.9%, 33.3%, 37.5%, 8.5% and 14.1%, respectively. We compared total and domain HRQOL scores across FCC of CHD.9 The acyanotic heart diseases were further classified into two groups: (1) left to right shunts and (2) left-sided obstructive lesions (LRS & LSOL respectively). The cyanotic heart disease was classified into three groups: (1) lesions with decreased pulmonary blood flow, (2) lesions with increased pulmonary blood flow and (3) single ventricle physiology (DPB, IPB & SVP respectively). We were not able to classify 13 subjects (infants 12, toddler 1) as per the FCC classification and they were excluded from subgroup analysis (table 3). There was no significant difference in mean total HRQOL across various FCCs for infants as well as toddlers (p=0.212 and p=0.502, respectively). No significant differences were seen for HRQOL domains as well as summary scores across various FCCs except for physical symptoms among infants (p=0.005). FCC class LSOL and SVP were omitted from comparison among toddlers due to low sample size in these categories (n=2 and n=3, respectively). As expected, parents of infants/toddlers with uncorrected CHD reported lower total HRQOL when compared with parents of normal infants/toddlers. The significant mean differences reported in the CHD versus control comparison for HRQOL among infants as well as toddlers suggest good discriminant validity for PedsQL. The mean differences in total HRQOL as well as for the majority of component scores appear to be more among toddlers. This finding suggests that as age progresses parents are noticing higher differentials in HRQOL among those with uncorrected CHD. In the domains of HRQOL, there was no significant difference in social functioning as well as cognitive functioning between those with and without CHD. This may probably be due to the difficulties in identifying social and cognitive responses in a proxy setting during this early phase of life. Approximately one in three infants/toddlers with uncorrected CHD qualified as those with significantly impaired HRQOL. This underscores the magnitude of the impact CHD has on the lives of these young children. The impact appears more prominent in areas related to physical functioning, physical symptoms and emotional functioning in infants/toddlers with CHD. Psychosocial problems have recently been recognised as a ‘hidden morbidity’ in paediatric/adolescent healthcare related to CHD.12 13 This morbidity has to be seen in the context of other significant burdens related to CHD care like economic impact of treatment and psychological health of their parents/caregivers.14 15 An earlier publication from the same study population has reported that more than half of the families of children with CHD experienced overwhelming to high financial stress during admission for surgical correction of CHD.14 The diagnosis of CHD in a child is also known to significantly impact the psychological health of parents, overall family life and parenting efforts.15 All these interacting domains of the overall burden of CHD require a comprehensive approach for the long-term benefit of children born with CHD and their families. The clinical utility of documenting serial HRQOL measures during the management of CHD appears reasonable considering the benefits listed earlier by Varni et al.4 A documented deficiency of HRQOL that is readily available at the point of care should naturally attract the attention of the treating physician and he/she may be more likely to dedicate additional time to resolving the same. Such interactions may also improve the overall satisfaction of the parents as it addresses one more domain of the overall burden of CHD. Currently, focusing on clinical outcomes is the common practice for most physicians attending chronic paediatric illnesses including CHD. The availability of reliable and sensitive HRQOL data can in all likelihood change this existing pattern of care in most of the chronic paediatric illnesses including CHD. The strengths of the current study include its large sample size, high response rate, use of a validated instrument and normative data used for comparison collected locally from a community setting. The limitations include a single-centre sample, exclusion of acutely ill infants/toddlers with CHD and a lack of broad geographical and ethnic diversity. The exclusion of acutely sick infants/toddlers with CHD may have introduced a selection bias in the study with a probable under-reporting of the actual deficiencies of HRQOL in the CHD subjects. This exclusion was necessary as it was not feasible to measure HRQOL while the infant/toddler with CHD was admitted in intensive care and/or taken up for immediate emergency surgery without a waiting period. These limitations may have affected the generalisability of the study results to a certain extent. Infants and toddlers with uncorrected CHD appear to have a significant deficiency of overall HRQOL. Approximately one-third of infants/toddlers with uncorrected CHD appear to have impaired HRQOL. The functional type of CHD appears to have no role in modifying the impact of CHD on overall HRQOL among infants and toddlers. Identification and quantification of HRQOL deficiency during infancy and early childhood will naturally assist us in providing comprehensive care to such children and may improve their overall outcomes in the future. The authors thank the families and children for their participation in the study. The authors also acknowledge the support of Dr Remya Sudevan, Sonu Kalappurackal Simon, Mary Paul, Sreeja Gopinath, Anu Alphonse Varghese, Anusree Soman, Shylala G and Georgeena Pulickal for the conduct of this study. U.S. Department of health and human services. Centers for disease control and prevention. National center for chronic disease prevention and health promotion. Measuring healthy days: population assessment of health-related quality of life. 2000 http:// www.cdc.gov/ hrqol/pdfs/mhd.pdf..
Census of India 2011. http://www.censusindia.gov.in/2011census/dchb/3208_PART_B_ERNAKULAM.pdf (accessed 25 Jul 2017). , eds. Pediatric critical care medicine. volume 2: respiratory, cardiovascular and central nervous systems. Second Edition. Springer-Verlag London, 2014. Ministry of health and family welfare, Government of India. National family health Survey 4 2015-16. State fact sheet Kerala. http://rchiips.org/NFHS/pdf/NFHS4/KL_FactSheet.pdf (accessed 26 Jul 2017).
. Psychopathology in pediatric primary care: the new hidden morbidity. Pediatrics 1988;82:415–24. Contributors MR conceived the idea and is the guarantor of the study. MR, RR, SS, LA, BC and RKK supervised the collection of the data. RR, SS, LA, BC and AS participated in data collection. MR, RKK and AS carried out data management. MR and AS analysed the data. MR and RKK drafted the manuscript. RR, SS, LA and BC read the drafts and provided feedback. All authors read and approved the final manuscript. Ethics approval Institutional Ethics Committee, Amrita Institute of Medical Sciences, Kochi, Kerala, India - Registration Number: ECR/129/Inst/KL/2013. Data sharing statement The de-identified raw data collected as part of this study are available for research purpose upon request to the Head of the Department of Pediatric Cardiology, Amrita Institute of Medical Sciences, Kochi, Kerala, India.